With a critical focus on US-Latin American encounters, the book analyses geopolitical issues from a post-colonial perspective. A novel approach to understanding US-Third World relations. Critically considers the genesis of US power. Interweaves ideas and events, interventions and representations. Highlights the contribution of Third World intellectuals. David Slater is Professor of Social and Political Geography at Loughborough University. He is the author of Territory and State Power in Latin America (1989), co-editor of The American Century (1999) and an editor of the journal Political Geography. Part I: Conceptual and Historical Issues. 1 For a Post-Colonial Geopolitics. 2 Emerging Empire and the Civilizing Powers of Intervention. Part II: Waves of Western Theory. 3 Modernizing the Other and the Three Worlds of Development. 4 The Rise of Neo-Liberalism and the Expansion of Western Power. Part III: Archipelagos of Critical Thinking. 5 Societies of Insurgent Theory: the Dependentistas Write Back. 6 Exploring Other Zones of Difference: from the post-modern to the post-colonial. Part IV: Geopolitics in a Globalizing World. 7 Post-Colonial Questions for Global Times. 8 'Another World is Possible' - on social movements, the Zapatistas and the dynamics of 'globalization from below'. 9 Conclusions: Beyond the Imperiality of Knowledge. "...stimulating, and replete with insights....no serious scholar of international relations can afford to miss it." "This book’s innovations include its systematic engagement with the works of Third World intellectuals, its rigorous conceptualization of Euro-Americanism, and a creative recovery of Gramscian Marxism; these features help to ground a very powerful framework for the post-colonial. This book is the product of a tremendous intellectual maturity and sophistication … the author engages and reworks, with great mastery and success, the best theories of our time." "This singular text challenges the “common sense” view of contemporary world power in an eminently sensible and sensitive manner. Written with admirable and unfashionable clarity … it provides a constantly suggestive tour d'horizon of the state of global geopolitics at the start of the millennium." "This book is part of the best tradition of research which, particularly since the 1990s, has been showing that a proper understanding of the world is necessarily much larger than a Western understanding of the world … Slater formulates a new critical theory that is adequate to the realities and possibilities created by the global times in which we live, and fully capable of accounting for the metamorphoses of the growing inequalities between North and South." 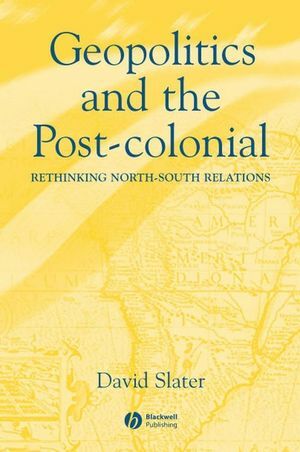 "It is specifically the reflexive and open-minded way in which Slater analyses post-colonial thinking in relation to geopolitics that makes this a very inspiring work." “A valuable addition to the study of Chilean politics after authoritarian rule, analyzing some of the most important factors explaining the trajectory from a brutal military dictatorship to a stable and rather prosperous democratic regime." Reconceptualizes geopolitics from a post-colonial perspective.